As I mentioned in my intro to this 40 Bags in 40 Days project, I was starting with the hard stuff. 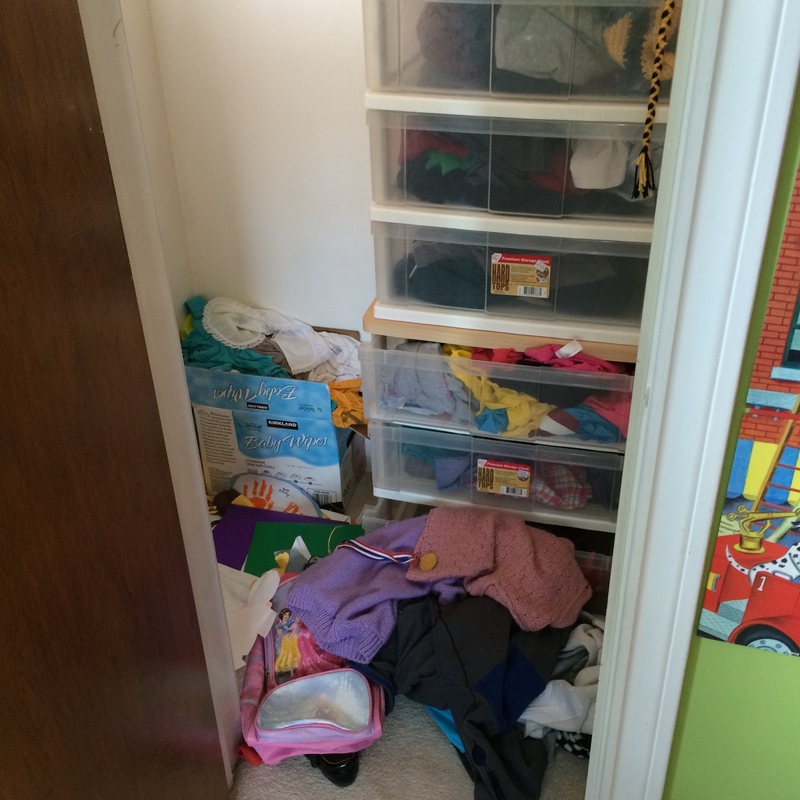 That would be...dun-dun...the kids' closet. The meat of the closet wasn't the problem. I have a dresser in there for off-season clothes, and the stuff on the shelves is still necessary/wanted and fairly neat. 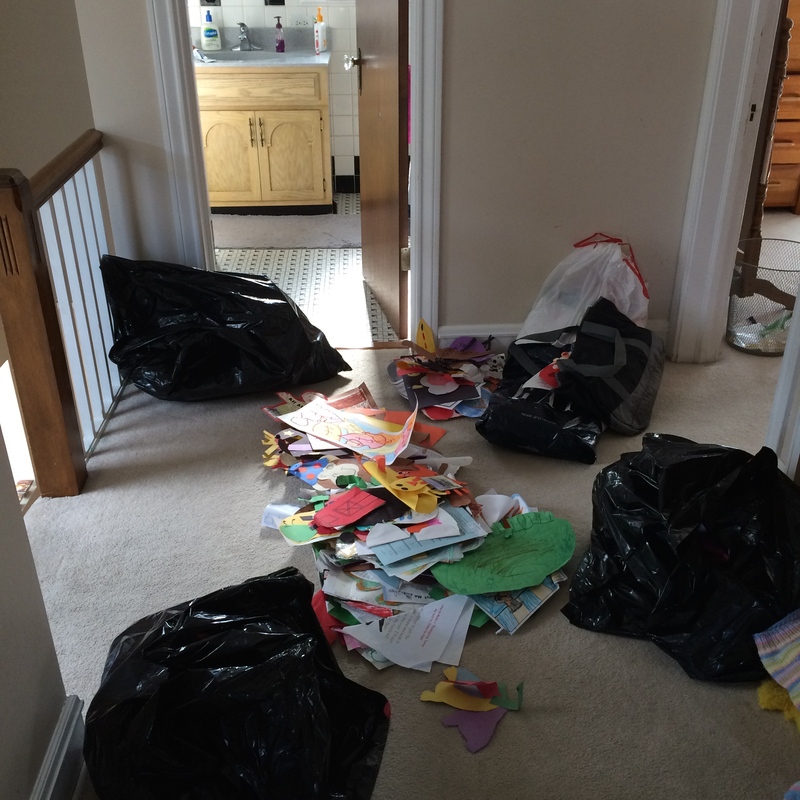 The big issue was that the closet floor had become a lava pit of all their schoolwork since my son started preschool -- three-and-a-half years ago. My plan has always been (since he was in three-year-old preschool; he's now in first grade -- yikes!) to take pictures of the artwork and get rid of the hard copy. 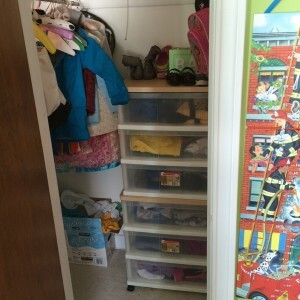 You can see by the size of the closet, we don't have a ton of extra space in this house to hold on to every single thing everyone's ever done. Around New Year's, I downloaded an app called Artkive, which stores pictures of your kids' stuff and keeps it organized by name and age. After each school year, you can compile the art into a print book. Before yesterday, I had taken two pictures with this app. Two. I had been putting this off for MONTHS. Literally. I used to shove all the projects out on the back porch, along with all the other stuff I didn't feel like dealing with -- boxes, grocery bags, books. But back in August, I converted the back porch into a seasonal office (now is not that season -- brrr!) and I had to find a new home for the kids' art. That home was at the bottom of their closet. Yesterday, I pulled everything out of there and sorted through their summer clothes (Cookies has no shorts that fit her from last year; girlfriend's a tree). Then I dragged the bags and piles of art projects down to the living room, turned on an episode of Scandal I barely cared about, and started clicking away. Now the kids' closet is clean and I'm well on my way to schoolwork organization. I even took pictures of the stuff they brought home yesterday right away. Go, me.